Valentines day was on a Friday this year. For two weeks Chris and I discussed going out vs. Chris preparing one of her excellent meals at home. I know she deserves to be pampered too and enjoys when we eat out. The problem is that there are not a lot of options near where we live unless you want to drive more than 30 minutes away. In addition to the drive, often times we easily can spend over $100 for the meal and she and I agree that she can do a better job at the fraction of the price. 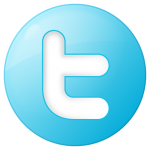 And, we have an excellent wine cellar with many wines to choose from that have already been paid for. In the end, we decided to stay home, save the money and enjoy a better meal in the quiet of our own home. 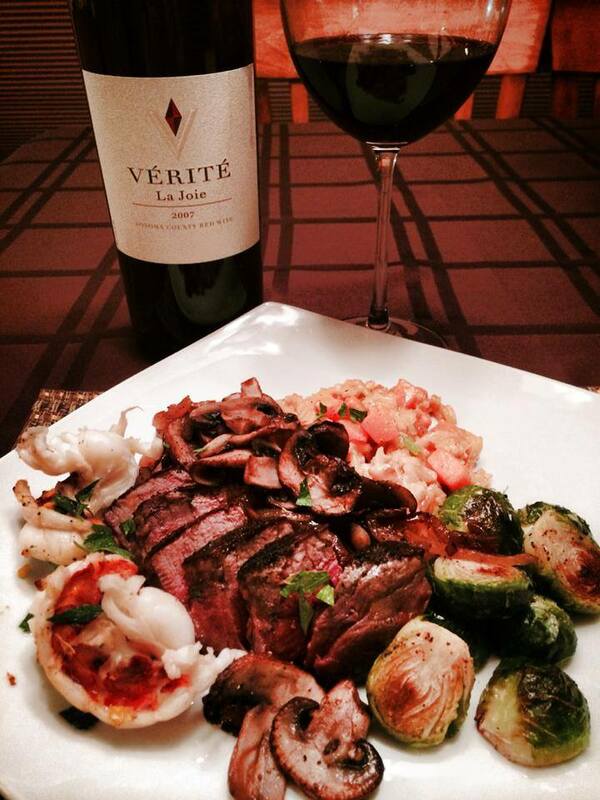 Chris decided to make us a surf and turf, including risotto with roasted butternut squash and Brussels sprouts. It was a great choice. Now it was up to me to pair a wine with the meal. The wine had to be excellent since she was making the meal. My mind starting racing with thoughts of Joseph Phelps Insignia, Shafer Hillside Select, Pine Ridge Fortis or Verite. For days I pondered over which one and switched from one to the other before eventually deciding that the 2007 Verite La Joie would win out. As you know Verite is my most favored wine (no I was not paid to say that), and is likely one of the most expensive bottles of wine I own. Friday afternoon was here and Chris started prepping for dinner. I find Verite wines are better when they are decanted. The wines need a little air and breathe, which allows the flavors to open up and show. I grabbed a decanter and the 2007 La Joie red wine, pulled the cork and poured the wine into the decanter. I swirled it around the decanter like a mad scientist, making sure the wine and air was completely mixed up. I allowed it to sit for a short time and poured each of us a glass. I wanted to taste the wine before she started cooking so that no aromas would interfere with our first sips. The color depth was deep and the hue was purple to garnet. The La Joie was moderate to aromatic without swirling my glass. It smelled young and I noted black cherry, cola, vanilla. The first sip was slightly dry but over time the dryness was gone. The La Joie was full-bodied and the acidity was balanced with soft tannins. Tasting the La Joie I there were complex layered flavors with a silky soft start and a velvet finish. The wine was very well-balanced. The finish was flavorful and long. Acolades – 100 points, Robert M. Parker, Jr., The Wine Advocate, June 2011. 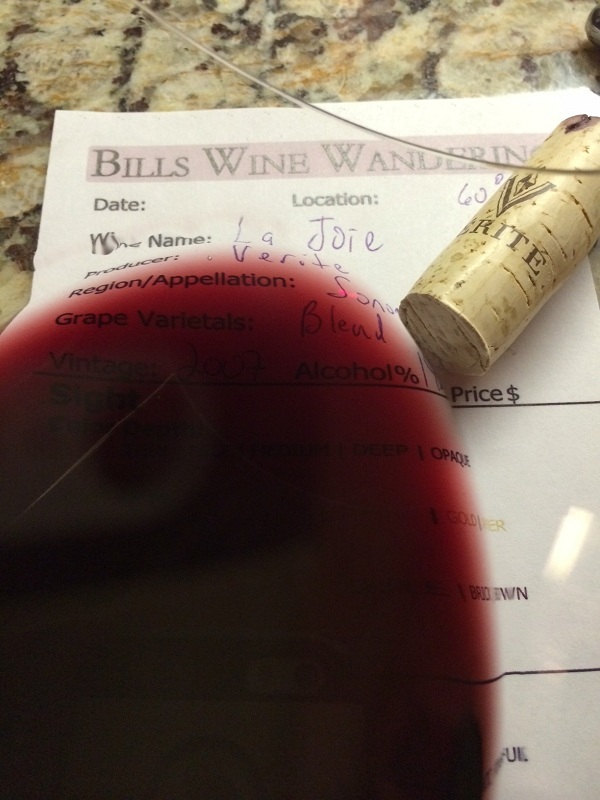 This was the first of many 100 point ratings for the Verite label. Composed of 68% Cabernet Sauvignon, 15% Merlot, 8% Cabernet Franc and the rest Petit Verdot and Malbec, the 2007’s fruit came from four sources, Alexander Valley Mountain Estate, Knight’s Valley, Chalk Hill and Bennett Valley. Pierre feels the wine can cellar for 30 years under the proper conditions. We just couldn’t wait that long! 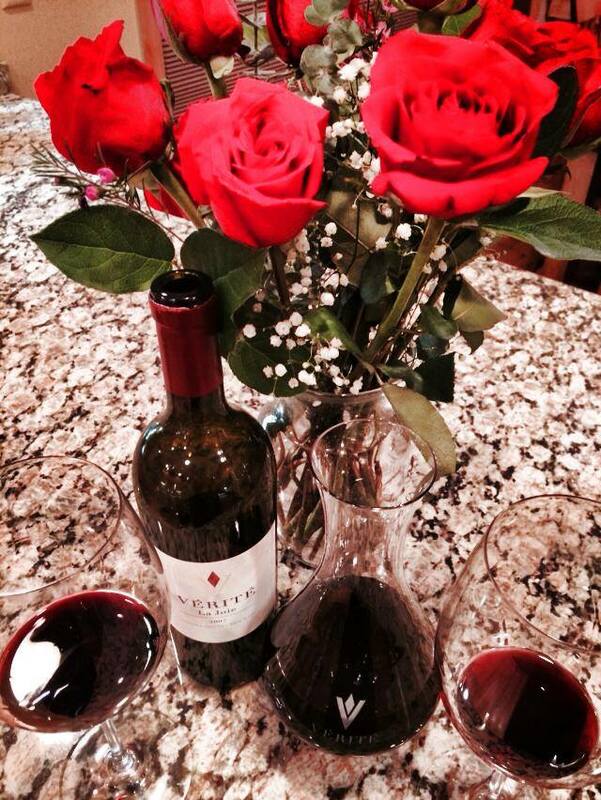 The 2007 Verite La Joie was the right choice for our Valentines dinner. Needless to say we finished every drop by the time our plates were empty. 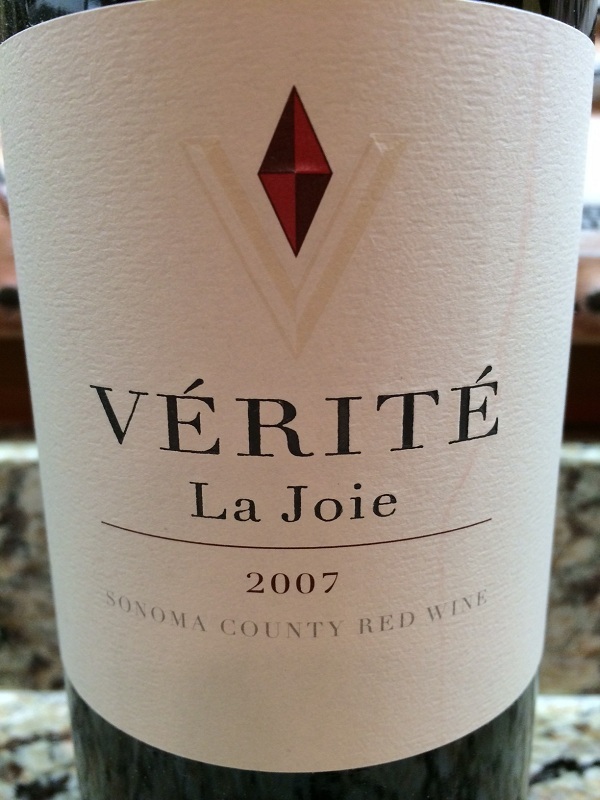 I rated the 2007 Verite La Joie four plus glasses.